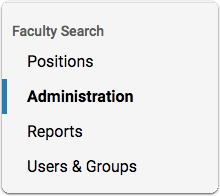 To print application materials in Faculty Search, you must download the materials and print the downloaded files. Click the Position Actions button and select Download to download the selected applicants' application packets. Each PDF contains all application forms and materials (transcripts, CV, teaching philosophy, etc. ), ready to print.